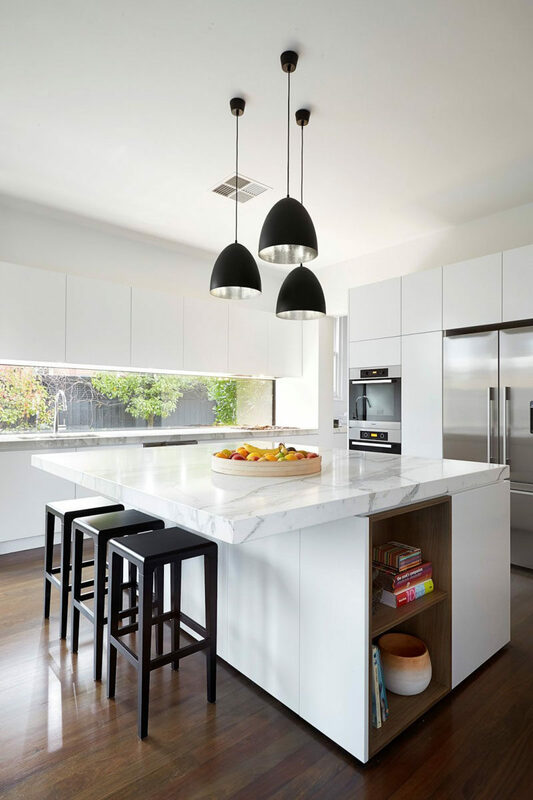 All white cabinetry in the kitchen is one of the easiest ways to brighten your home and make it feel more open. 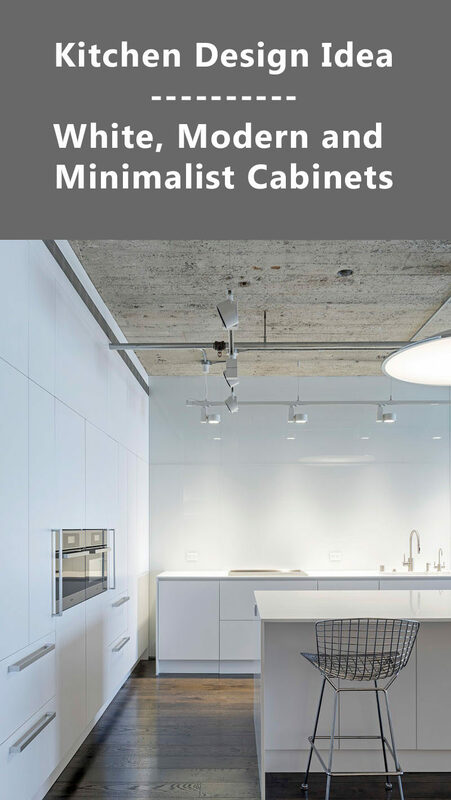 Even if you have other materials like wood, stainless steel, tile or metal, white cabinets help open up the space and make it feel more modern and clean. 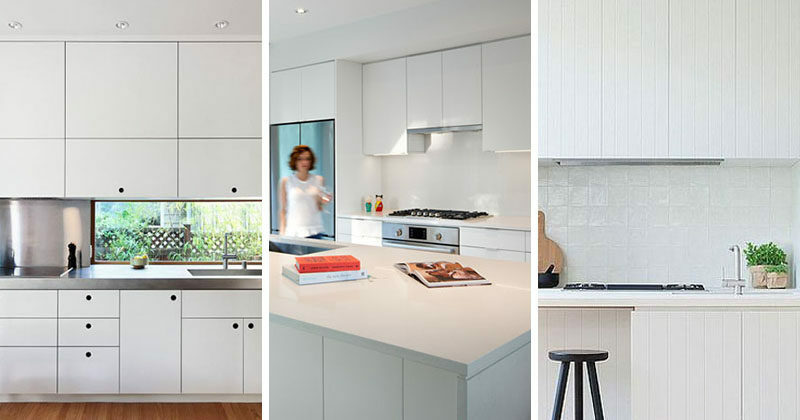 Here are 21 inspirational examples of kitchens that all have white, modern and minimalist cabinets. 1. 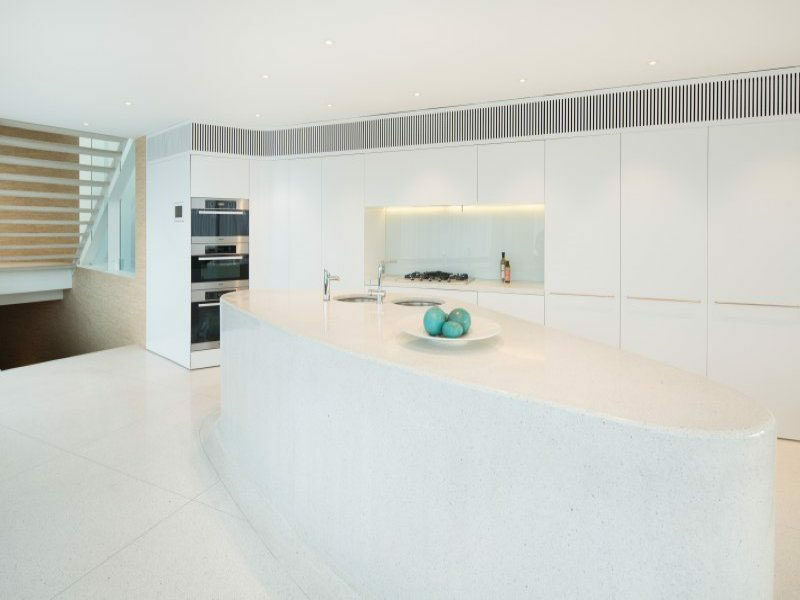 This all white kitchen features white handle-less cabinetry to create a smooth streamlined look. House in Malaysia by Fabian Tan Architect. Photography by Eiffel Chong. 2. 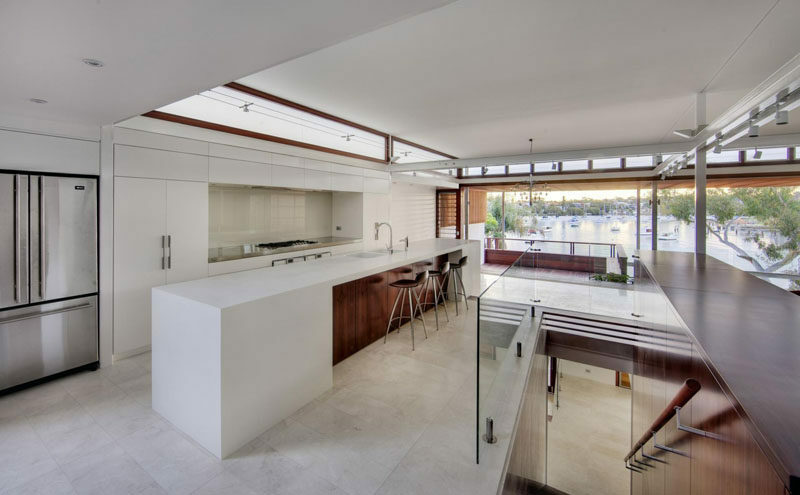 The white cabinetry in this kitchen is warmed up with the rich-toned wood along the upper windows and on the island. See more photos of this house, here. Designed by CplusC Architectural Workshop. Photography by Clinton Cole. 3. 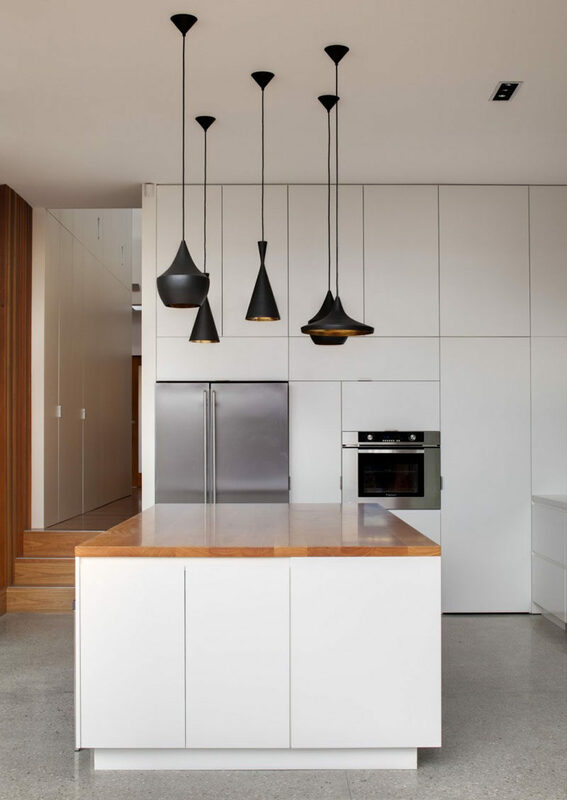 White cabinets of different sizes give the walls a geometric look to them and the minimal hardware keeps everything looking smooth. See more photos of this house, here. Designed by CplusC Architectural Workshop. Photography by Murray Fredericks and Simon Whitbread. 4. 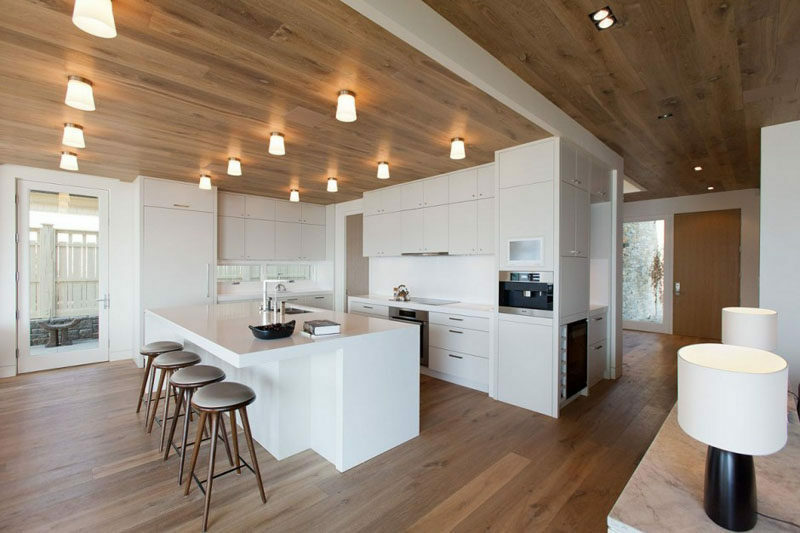 Crisp white cabinetry in this kitchen brightens up the wood and creates a more modern look. See more photos of this house, here. Designed by SHED Architecture & Design. Photography by Mark Woods. 5. 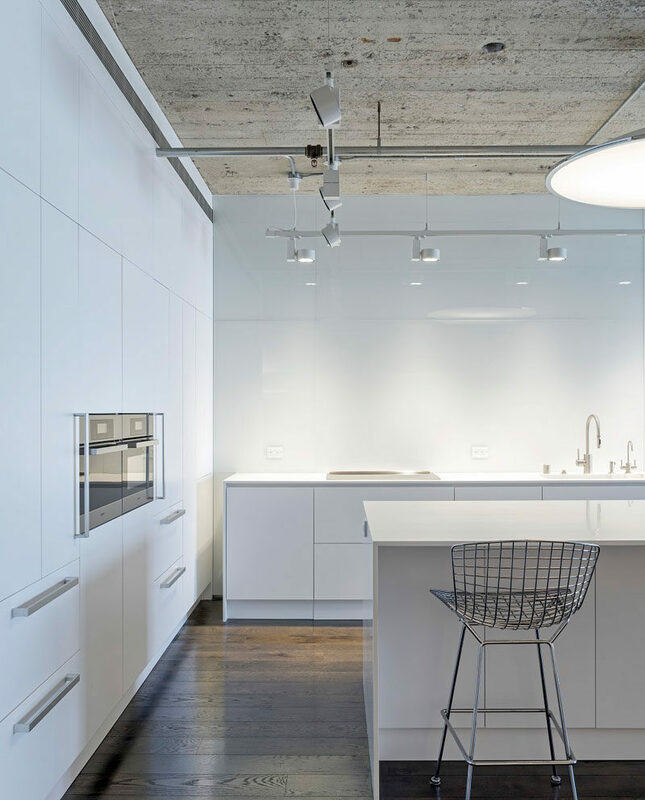 The use of white cabinets and concrete floors give this kitchen a modern and industrial look. See more photos of this house, here. 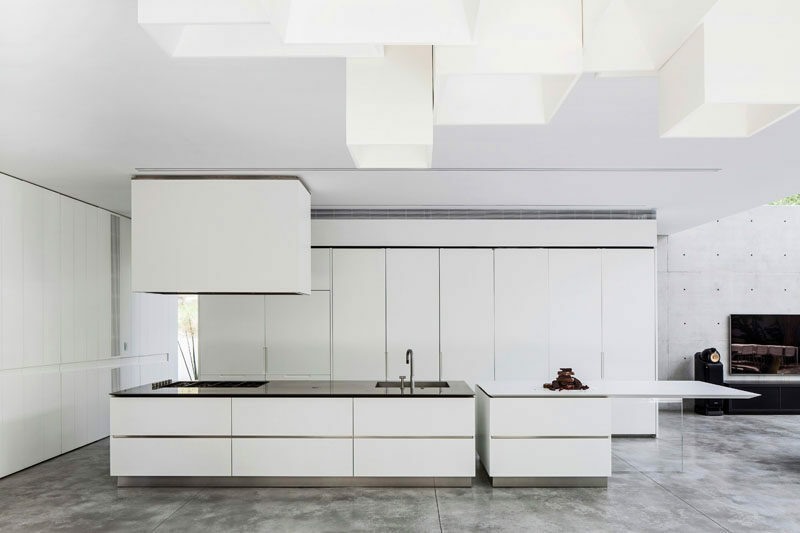 Designed by Pitsou Kedem. Photography by Amit Geron. 6. 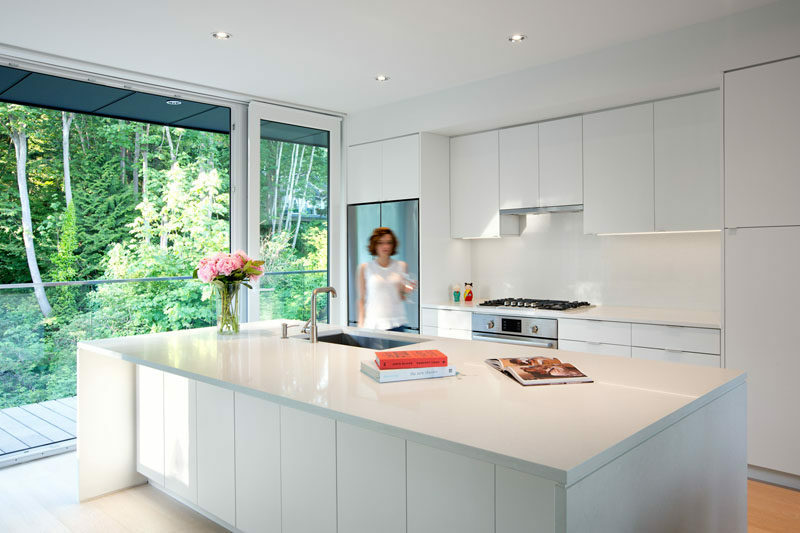 These white cabinets reflect the natural light that streams through the windows to make the kitchen even brighter. Designed by omb (office of mcfarlane biggar architects + designers). Photography by Ema Peter Photography. 7. 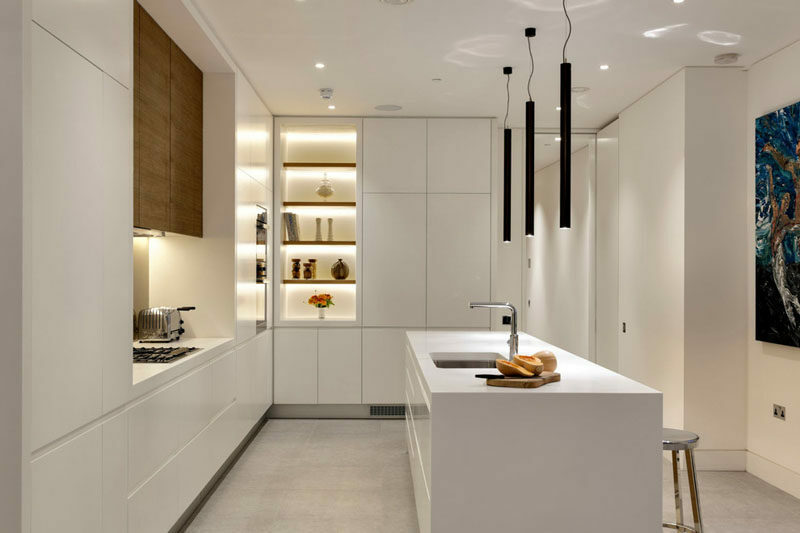 The wall of white cabinets in this open kitchen flows with the rest of the white throughout the interior, and the wood countertop and backsplash warms up the white. See more photos of this house, here. Designed by Evolution Design. Photography by Peter Wuermli. 8. 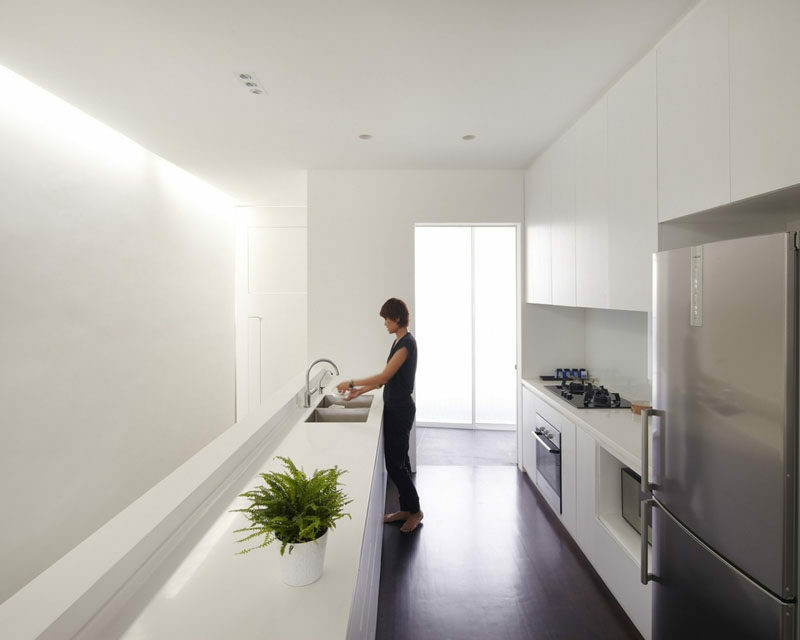 The walls of white cabinetry contrast the concrete in this apartment and makes for a contemporary feel throughout. See more photos of this house, here. Designed by Steven Stept and Irit Axelrod and Feldman Architecture. 9. Warm wood above the stove, and soft lighting creates a cozier feel in this kitchen with all white cabinetry. Designed by Form Studio. Interior design by Elizabeth Bowman. Photography by Bruce Hemming. 10. 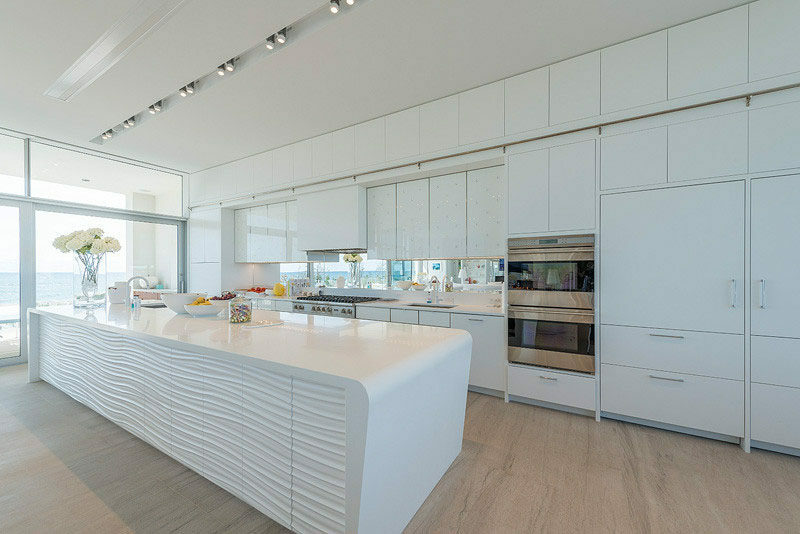 White cabinetry, white countertops, and an all white island give this kitchen a clean look and brightens up the rest of the living space. See more photos of this house, here. Designed by Barnes Coy Architects. Photography by Paul Domzal / EdgeMediaProd.com. 11. The white cabinets in this kitchen contrast the darker elements in the space like the dark island, dark chairs, and dark wall. See more photos of this house, here. 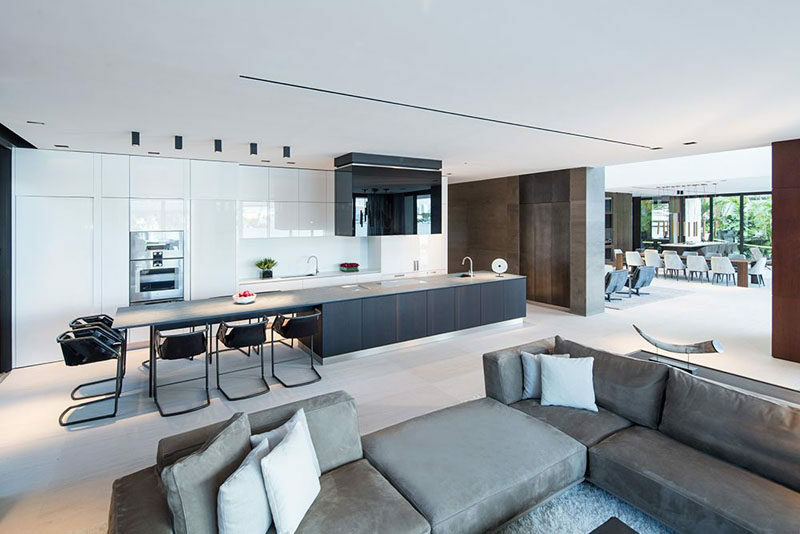 Designed by Choeff Levy Fischman Architecture + Design. Photography by Robin Hill. 12. 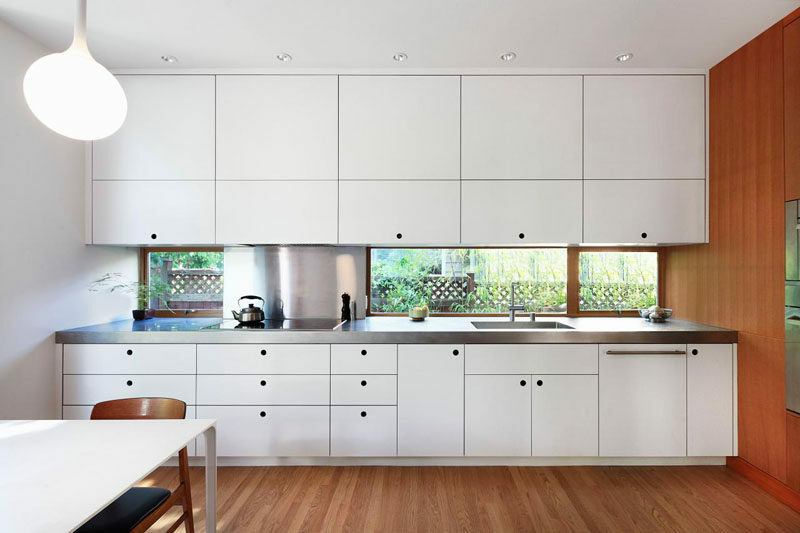 The hardware-free white cabinets of this kitchen are softened up by warm wood flooring. See more photos of this house, here. Designed by Ong & Ong Architects. Photography by Derek Swalwell and Tim Nolan. 13. 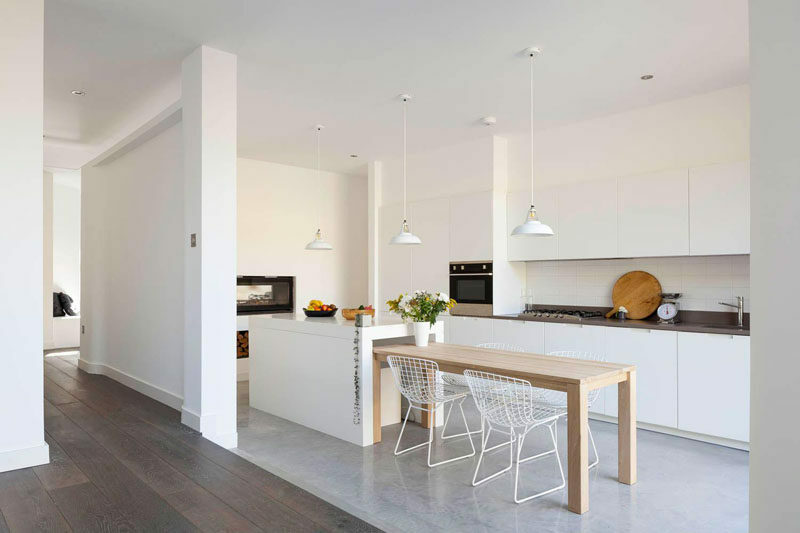 This all white kitchen breaks up the wood floor and ceiling to create a more modern looking space. See more photos of this house, here. Designed by Robert Bailey Interiors. Photography by Josh Dunford. 14. 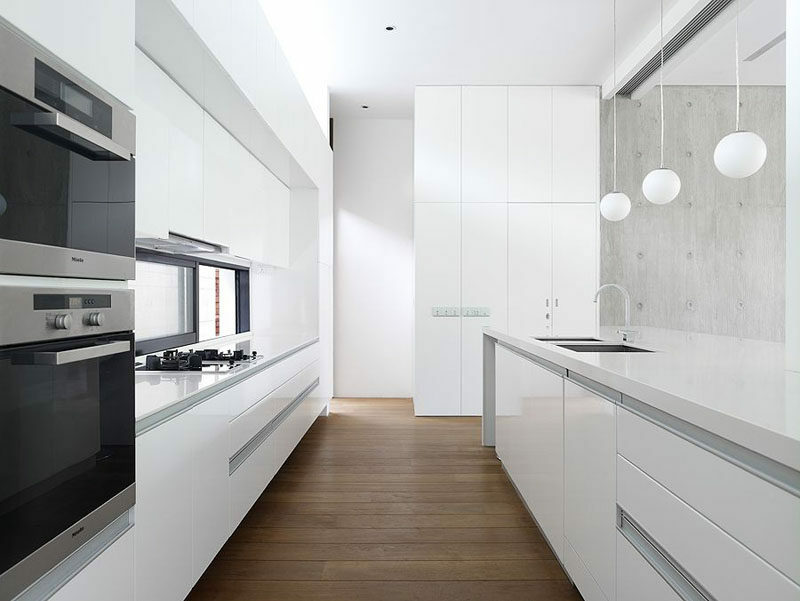 The white cabinets without hardware give the kitchen a smooth and streamlined look. See more photos of this house, here. Designed by Desai/Chia Architecture. Photography by Paul Warchol. 15. Everything except for the appliances is white in this super clean, bright kitchen. See more photos of this house, here. Designed by Lippmann Partnership. Photography by BHR Estate Agents. 16. 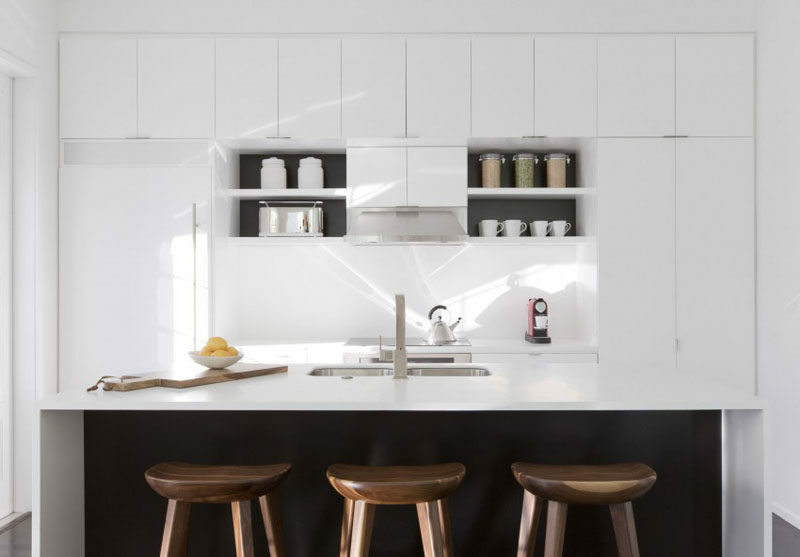 There’s just the right amount of black in this kitchen to contrasts the all white cabinetry. See more photos of this house, here. Interior design by Cecconi Simone Inc. Photography by Joy von Tiedemann. 17. A few black details, including the stools, the stove, and the sliding barn door, interrupt the all white cabinetry in this modern kitchen. See more photos of this house, here. Designed by Robson Rak Architects. Interior design by Made by Cohen. Photography by Shannon McGrath. 18. The white cabinets, stainless steel appliances, and marble countertops give this kitchen a super modern feel, while the wood floors keep it feeling warm and homey. See more photos of this house, here. Designed by LSA Architects. Photography by John Wheatley from UA Creative. 19. The white cabinetry in this kitchen is only broken up by the black appliances and small decorative elements like the green kettle and red art piece. See more photos of this house, here. Designed by over,under. 20. 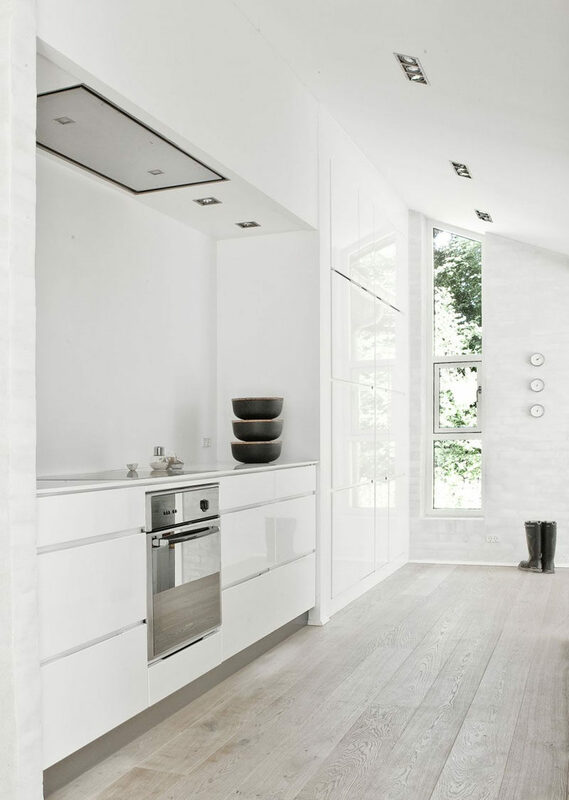 The white cabinetry of this kitchen and the light wood floor give the space an extremely bright look that’s amplified by the natural light coming through the windows. See more photos of this house, here. 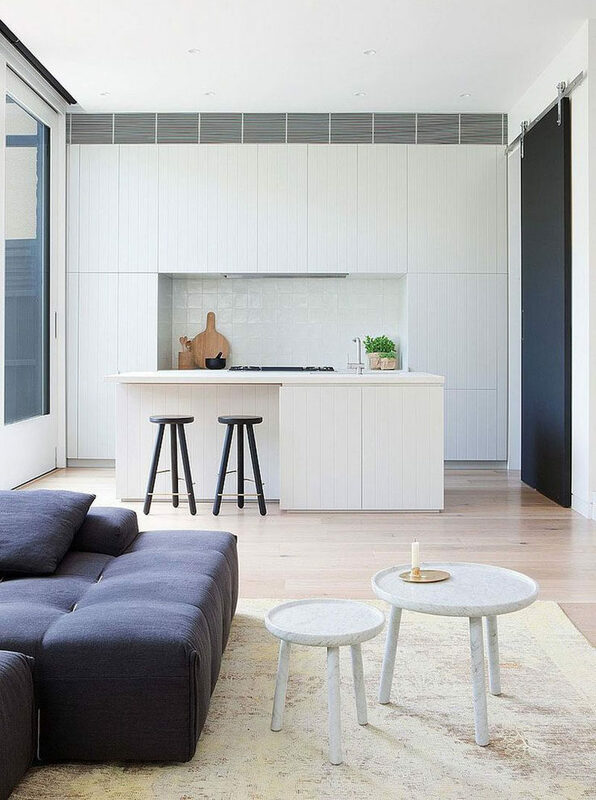 Designed by NORM Architects. 21. 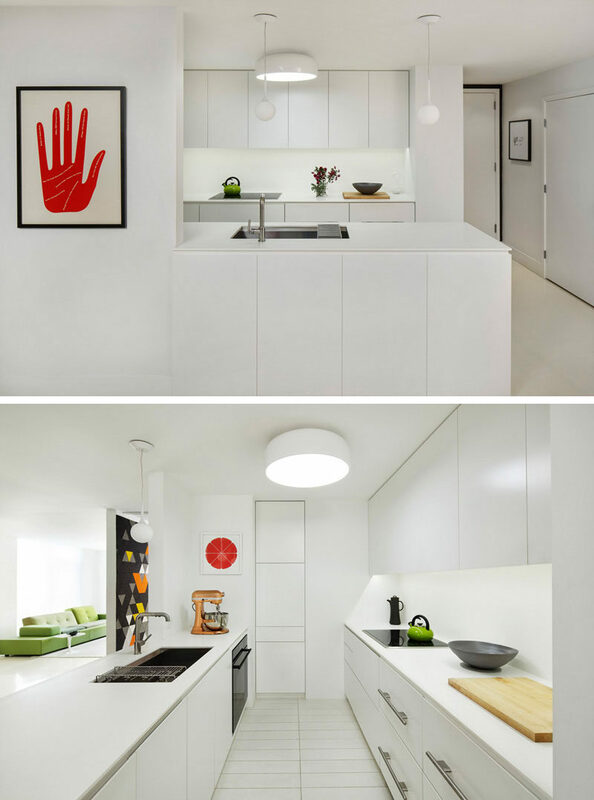 The white cabinets in this kitchen appear to blend right into the white walls and create the illusion that they reach up to the ceiling. See more photos of this house, here. Designed by Scenario Architecture. Photography by Matt Clayton.